La PAZ, Bolivia. (August 10th, 2011) — It is a pleasure to announce that The Original British Football brand to England’s top teams and North American Soccer League, Admiral, will be official supplier to Club Bolivar from the start of the 2011-2012 Season. Admiral is the same brand that provided team wear in the 1970s and 1980s for the England football team, Manchester United, Tottenham Hotspur, West Ham, Southampton and Leeds in the English premier division. They were also the market leader in the USA on the shirts of legends Pele, Beckenbauer & Cruyff, whilst they played at the New York Cosmos, Los Angeles Aztecs, Tampa Bay Rowdies and Vancouver Whitecaps. “It’s exciting to be launching Admiral in Bolivia with the league Champions," says Dale Self, of Admiral Soccer.“We’re looking forward to working with the club, and making great sportswear for the fans. Admiral has been worn by giants of the game and we’re proud to see it worn by the giants of Bolivia." “Admiral is the oldest soccer brand in the world, with nearly 100 years of heritage. We are proud to be associated with the original British football brand. Especially one strongly associated with some of the best teams in the world.” Said Marcelo Claure, Chairman of Club Bolivar. “The goal is to outfit other national and club teams throughout Latin America. We’re starting at the top, with the Bolivian Champions, a great place to start” says Self. Bolivar will unveil the new home uniform to the public on Wednesday, September 7th. Their first game of the season is September 8th. 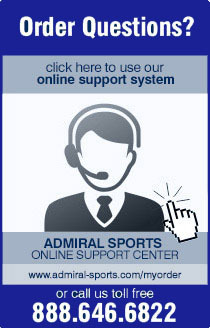 Admiral will be available online atwww.admiralsoccer.com and at the local Club Bolivar retail store.